How good is your math? Are you up for a challenge? Try solving these riddles. Below were questions prepared and designed by me. If you can't answer the questions, please don't fire at me, huh…Wassup, don't show me your sour face, smile a bit, will you? Well, I've worked out these questions for certain days. Now, it's your turn to have your mind twisted while trying to solve these Mathematical questions. I assure you that these questions will keep your brain staying active to delay aging process. Regardless your ages, occupations, and qualifications, you're invited to challenge yourself with these trickiest questions. Do tell me your score, por favor (“please” in Spanish)! Now, get yourself ready, sit still, and here we go…Good luck! 2. James needs 15 days to assembly bulks of accessories for a car, but Dave needs only 12 days to accomplish the task. Now, let me ask you how much more pieces of accessories does Dave manage to accomplish as compared to James? 3. Given that a + b = c = 10. Now, find the value of 2a + a + 3b. 5. How to get 10 from the four whole numbers of 1,1,9 and 9? 6. What's the proper way to calculate 8-1-3x/2 = 0? 9. There're 16 small squares in one big square. 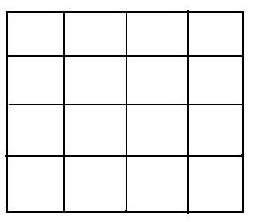 How many squares are they in total? Without using calculator, calculate 9,9,9 and 1 to get 100. You can apply addition, subtraction, multiplication and division to get the answer. How do you obtain 24 with digit numbers of 5, 5, 5 and 1? How do you obtain 24 with digit numbers of 3,3,8 and 8? Using addition, subtraction, division and multiplication, find the answer of 21 from the digit numbers of 5,5,5,5 and 5? Note: Each question earns you 3 marks.